"Dermatologist, Vaginal Tightening Specialist & Hair Transplant Surgeon"
Dr. Arushi Dudeja is a Sr. consultant dermatologist and hair transplant surgeon at DermaClinix, Defence Colony as well as the best vaginal tightening specialist doctor in Delhi NCR. She did her M.B.B.S from Subharti Medical College and Hospital, Meerut (U.P) and MD in Dermatology from Mahatma Gandhi Mission’s Medical College and Hospital, Aurangabad (Maharastra). 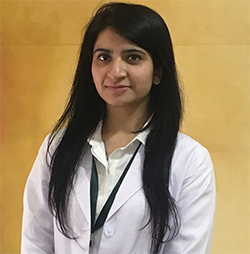 To hone her skills, she did an internship for one year at Subharti Medical College and Hospital, and participated in various conferences and workshops where she can interacted with the top dermatologists of India and gain experience. Our hair transplant surgeon believes in providing the best possible results and services to patients all across the world. She has participated in various camps providing free-medical help to poor people. Her practical experience of diagnosing the diseases and providing solutions is commendable. Besides performing hair transplant surgeries and SMP's (scalp micropigmentation) in Delhi, She also provides excellent skin and hair treatments, including Peeling, q-switched, alexandrite, diode Laser therapy, Radiofrequency treatment, PRP Therapy, etc. She completed her M.D in Dermatology from Mahatma Gandhi Mission’s Medical College and Hospital, Aurangabad (Maharastra) in 2016. She did her M.B.B.S from Subharti Medical College and Hospital, Meerut (U.P) in 2012. PG Quiz in 2nd DAAS SUMMIT, July, 2015. IADVL SIG Trichology hair transplant CME. Hair raisess, Hair transplant CME. Review article on ‘Dermatological Manifestations in Hematological Diseases’ in Medpulse Journal (Volume II, Issue 10, October 2015). ‘A Study of Cutaneous and systematic Associations of Vitiligo’. Paper Presentation- ‘A Study on PLE in Marathwada Region’ in MID DERMACON 2014. She strives to deliver the patients with the best optimal hair transplantation results. Beside Hair transplantation, she has also keen interest in q-switched,alexandrite, diode Laser therapy, Peeling, Radiofrequency treatment, PRP therapy, SMP (scalp micropigmentation) etc.